Managing Your Money in Retirement is a concise overview for new retirees, presented in three steps. “Define Your Retirement Needs” emphasizes the everyday expenses needed to maintain one’s standard of living. “Add Up What You Have” covers both regular sources of income and assets, such as savings and home equity. “Decide What to Do” walks the reader through the planning process and suggests how to handle shortfalls. 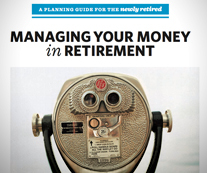 Managing Your Money in Retirement is available for $2.75 each (1-99 copies) or $2.50 each (100 or more copies), plus shipping. To place an order, click here. © 2009, by Trustees of Boston College, Center for Retirement Research. All rights reserved.